We've seen this comparison made before, albeit never as lucidly as this. Behold: major countries of the world, overlaid atop an outline of the positively giant African continent. 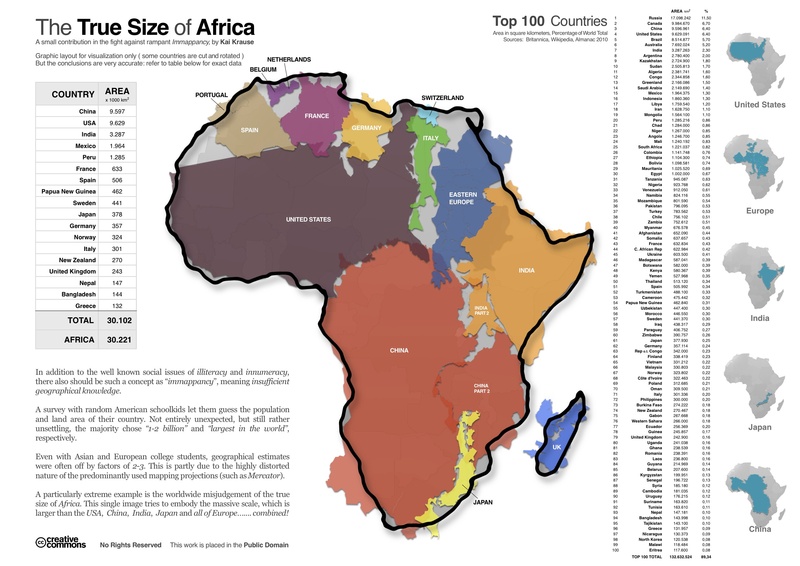 A particularly extreme example is the worldwide misjudgment of the true size of Africa. This single image tries to embody the massive scale, which is larger than the USA, China, India, Japan, and all of Europe... combined! Even if you have seen this size-comparison made before, you'll appreciate the handy list of countries, presented by total area in square kilometers, that accompanies it. Notably, Africa is still only the second-largest continent on Earth; Asia outstrips it by about 13.5-million km2.